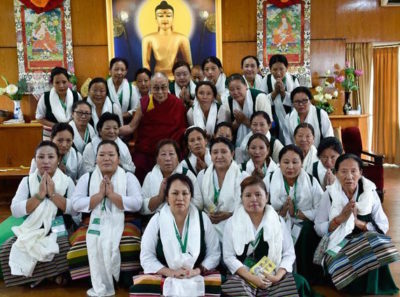 May 14, 2018 Thekchen Chöling, McLeod Ganj, Dharamsala, HP, India – His Holiness the Dalai Lama met this morning with 190 members of the Tibetan Women’s Association (TWA) who have gathered from 37 different settlements in India, Nepal, Belgium and US for their triennial board meeting. “We became refugees nearly sixty years ago,” His Holiness told them. “During that time the world has come to appreciate the Tibetan tradition of Buddhism. Now even modern scientists take a keen interest in what it has to say. As refugees we have succeeded in presenting to the world our unique Tibetan identity as expressed through our distinct religious traditions, our language, our modes of writing and so forth. 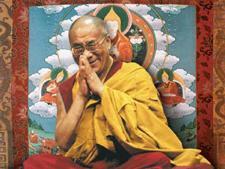 “Many people tell me how much they appreciate Tibetans’ compassionate, cheerful, good nature and their warm smiles. We have succeeded in presenting a positive image of Tibet to the world. His Holiness expressed his pride that he has been able to pass political responsibility to a leadership elected directly by the Tibetans. But he confirmed that despite his political retirement, he is committed to contributing to the preservation of Tibetan culture, religion and the natural environment of Tibet. He remarked that Tibet’s healthy ecology concerns not only Tibetans, but also millions of people across Asia who depend on Tibet’s rivers as sources of water. “As Buddhists we always pray for the welfare of all sentient beings, but from a practical point of view it is only among the human beings on this planet that we can work to promote compassion and warm-heartedness. In that context, scientists have observed that women are more sensitive towards others’ pain than men. Thus, biologically, women are more inclined to show compassion. “In my own life, I never saw an angry expression on my mother’s face. She was kind to everyone. Her compassion was vividly reflected in the way her eyes filled with tears whenever she came across others in pain or distress. My mother was my first teacher of compassion, which is why I believe we first learn about kindness at home.